Catch A Wave & You’re Sitting On Top Of The World. Pig shows his cool form. Photography by Tina VaLant. Attention beach-loving dogs and their humans, the Hang 20 Surf Dog Classic will be Saturday, August 29, 8am-noon, at Carlin Park in Jupiter, Florida. Imagine four legged bikini-clad Bettys and plenty of canine surf action with tasty waves and cool rides. 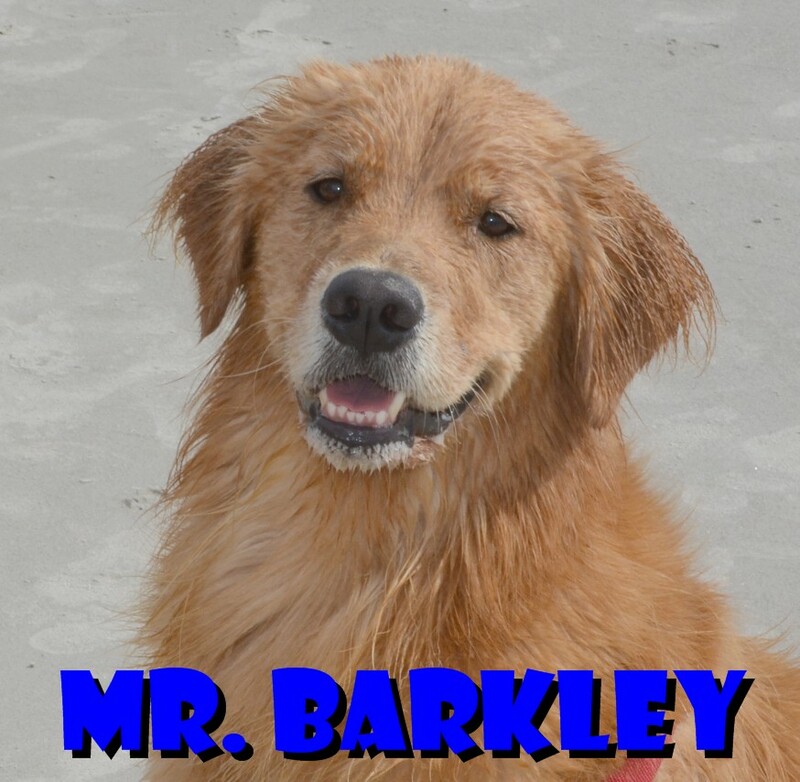 Well-known canine surfers who are planning to compete will include: Mr. Barkley, a Golden Retriever, who is also a therapy dog. 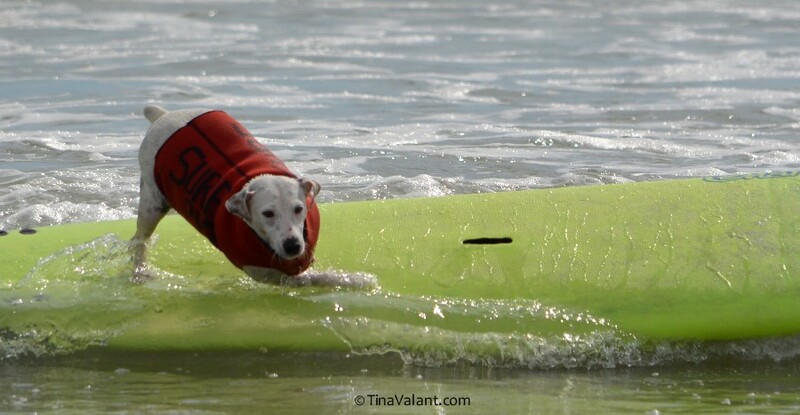 Surf Pig, a rescued Terrier-tripod (shown above) Yes, you read that correctly, he surfs 15. Waldo, a rescued Terrier mix who splits his time between Sebastian, Florida and Eleuthera, Bahamas. Our South Florida rover reporter/photographer Tina VaLant will be on-site to cover the event for The New Barker. The weather, as of now, calls for partly cloudy skies. Surf should be good. Safety First for our Surf Dog Champs. Interesting In Teaching Your Dog To Surf: Advice to prep from the surfdogs: Get a surfboard and practice in a pool. Get comfortable. Sit, lay and stand on the board. Have your human gently push the board away, and slowly pull it back. This teaches balance and to use your back legs to steady the board, without the distraction of waves. When this all becomes easy, venture to the ocean on a calm day. Take it slow and work up to standing on the board and riding the waves. Keep training sessions short and sweet. Always end on a good note. When it stops being fun that day––STOP. When you insist on doing something that your dog doesn’t enjoy you will break the feeling of trust between you and your dog. That can be irreparable. Safety first. 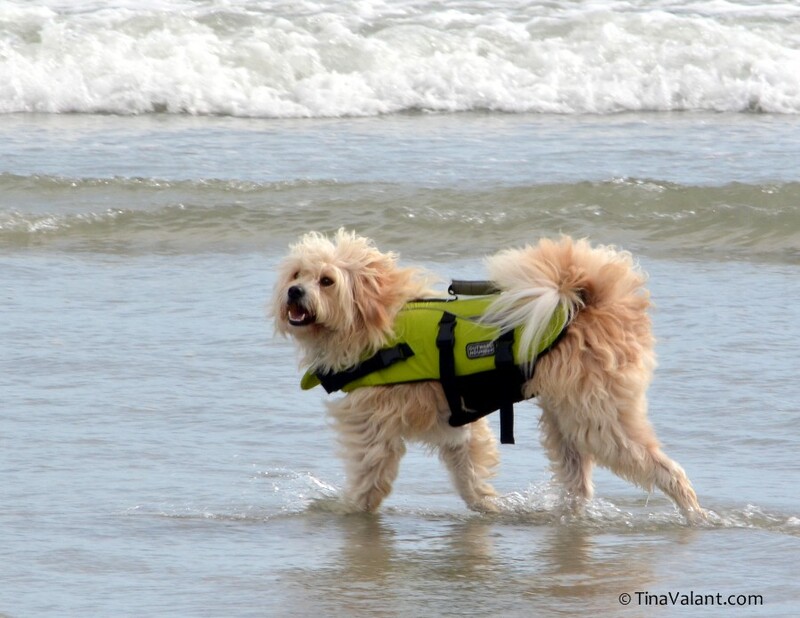 Make sure your dog has a properly-fitted life vest, for ocean rides. Proceed slowly and pay attention that your dog isn’t becoming stressed. Bring plenty of fresh water and a bowl from home. Hang Dog Surf Dog Classic will benefit Furry Friends Adoption & Clinic, a 501c3 not for profit organization located in Jupiter. Operations consist of a veterinary clinic, thrift store, adoption center, and ranch. Furry Friends provides an invaluable service to homeless animals to the northern Palm Beach/Martin county community. FurryFriendsAdoption.org 401 Maplewood Drive, Suite 10, Jupiter, FL 33548 561.747.5311. There will be more of these. More than 2000 people and their dogs came out to watch and/or participate. It was a pretty spectacular day. Previous Previous post: Passing Through The Eye Of The Storm Together. Next Next post: A Breed Apart.